Click here and here to view high-resolution versions of these pictures. Puntarelle is a variety of chicory, with long serrated leaves similar to dandelions. Its flavor profile is a cross between endive, chicory and arugula. Tasty raw or cooked, cooking mellows puntarelle’s unusual flavor, so the shoots and leaves are most often served raw in salad, particularly a salad with a rich, powerful anchovy dressing that makes the faint bitterness seem almost sweet. Here, it’s sautéed in unsalted butter along with lamb’s quarters, wild mushrooms and ramps, then combined with potato gnocchi. Onion chives and freshly grated pecorino romano cheese add finishing touches. The traditional way to eat French breakfast radishes is to serve them with unsalted butter, salt and freshly baked bread. They have a crisp texture and a delicate, sweet flavor that reminds me of gentle spring rain falling softly on a grassy field. 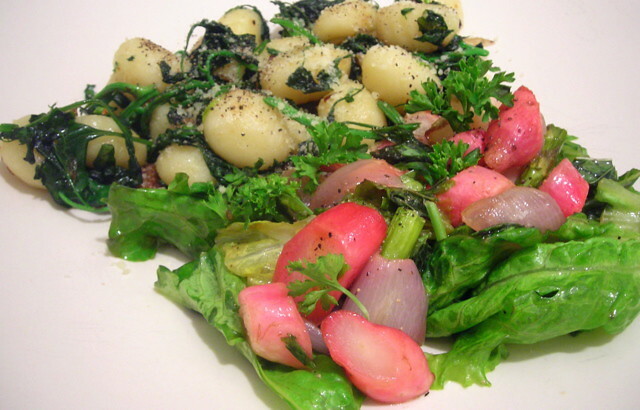 To make the salad, slice and trim radishes, then combine with slivered asparagus, shallots, a pinch of salt and olive oil in a Pyrex dish or a roasting pan. Roast at 350 F for 30 minutes. Remove pan from the oven and let cool slightly. Tear green leaf lettuce into bite-size pieces; fold into vegetables. Toss quickly; you want to partially wilt the lettuce but not all the way through. The greens should still have some “bounce” to them prior to service. Ideally, the vinaigrette should be made once you get to this step — it’s just extra-virgin olive oil, salt, pepper, rice wine vinegar and finely chopped mint. Exact proportions aren’t given (I prefer a ratio of 1/4 vinegar to 1 part olive oil since the vinegar and the mint can quickly overwhelm the vegetables in the salad). Lightly dress salad with the vinaigrette, then serve at once. Time: One hour, including prep. 09 Jun	This entry was published on June 9, 2010 at 2:31 am. 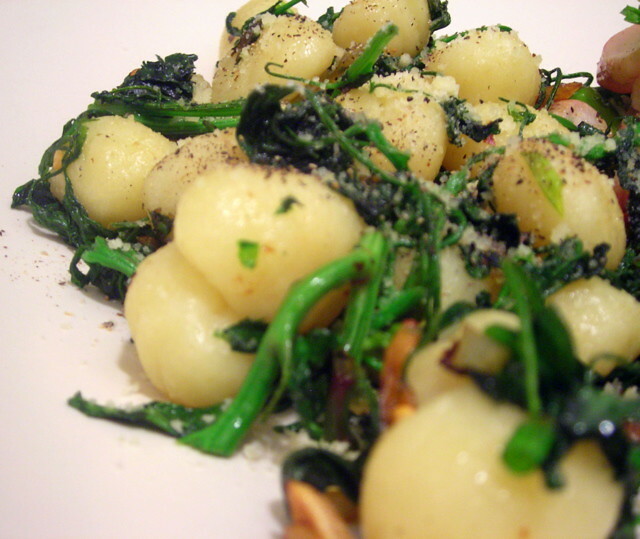 It’s filed under food, general, spring, vegetarian and tagged asparagus, dinner, gnocchi, greens, lamb's quarters, mint, puntarelle, radishes, ramps, salad, seasonal and local, vegetarian, wild mushrooms. Bookmark the permalink. Follow any comments here with the RSS feed for this post.